GIY & innocent Drinks have launched the fifth annual ‘Sow & Grow’ project, which aims to get primary school children to get their hands dirty while sowing and growing their own vegetables. This year’s ‘Sow & Grow’ Ambassador and RTE’s ‘Operation Transformation’ nutritionist, Aoife Hearne was on hand to launch the project with pupils of Our Lady of Good Counsel Boy’s National School in Drimnagh. 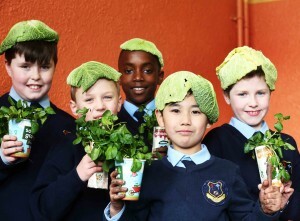 This year’s ‘Sow & Grow’ initiative will facilitate 30,000 primary school children from all across Ireland in their learning to grow cress, peas and spinach. Over the last four years innocent and GIY have facilitated more than 80,000 school children to have their first growing experience in classrooms countrywide. From March 1st, teachers and youth-group leaders can apply for one of the free Sow & Grow packs on sowandgrow.innocentdrinks.comfor their classroom or group. Each pack includes 30 growing pots, seeds, soil, lesson plans and growing guides. Studies show that children who grow their own food are more likely to eat fruit & veg, show higher levels of knowledge around nutrition and are more likely to continue healthy eating habits throughout their lives. Registered schools are encouraged to track their growing progress throughout the term by writing about or uploading photos of their vegetables to the Sow & Grow website. For every school that does this, they will receive a Sow & Grow certificate as well the chance to win a class trip to Bloom Festival 2016 and Dublin Zoo, €500 of gardening equipment. Visit sowandgrow.innocentdrinks.com for further info and to register for an innocent & GIY ‘Sow & Grow’ pack.